Grief takes so many forms. It’s like a light switching on and off. It’s on and it’s unbearable; then it goes off because it’s unbearable, because you can’t have it on all the time. It fills you up and it drains you. I forgot that Ole-Jakob was dead a thousand times a day. I remembered a thousand times a day. Both were unbearable. Dentist Karl Meyer experiences his worst nightmare when his son Ole-Jacob commits suicide. The tragic case of the death of his son is the initial point of this multilayered novel that will confront the readers with the extremes of human experiences. How deep can a man be driven into despair? Already the first part of the book reveals the extent of sorrow and grief – focusing on the collapse of the family. The second, shorter part is following Karl Meyer through a part of Europe dominated by legends and myths which finally brings him to a house in Slovakia. In the final part he gets confronted with the worst experiences in his life in a never-ending loop. „Through the night“ is the powerful fusion of dream, adventure and ghost story. 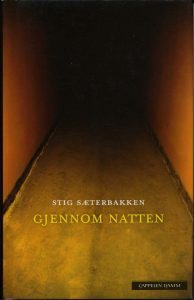 STIG SÆTERBAKKEN (1966-2012) was one of Norway's most critically acclaimed authors. His books have been compared to works by artists such as Beckett, Bernhard and Polanski. Sæterbakken's novels often explore the inner life and morality of human beings. Darkness looms in his stories, and yet they are written in a brilliant language.